Here are fitting touches to your workplace... a fluorescent, overhead work light and a power bar. Both are custom designed for use on Workplace Solutions workstations. 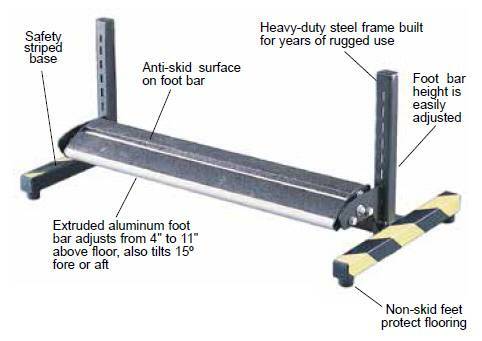 Seated or standing, your workers can be more productive and more comfortable when a foot rest is used. 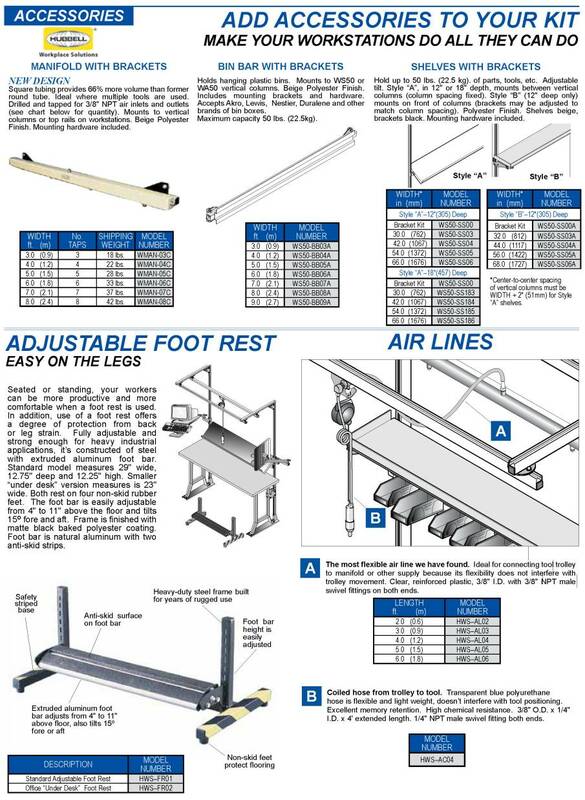 Fully adjustable and strong enough for heavy industrial applications, it's constructed of steel with extruded aluminum foot bar. Standard model measures 29" wide, 12.75" deep and 12.25" high. For loads up to 50 lbs. (22.5 kg). 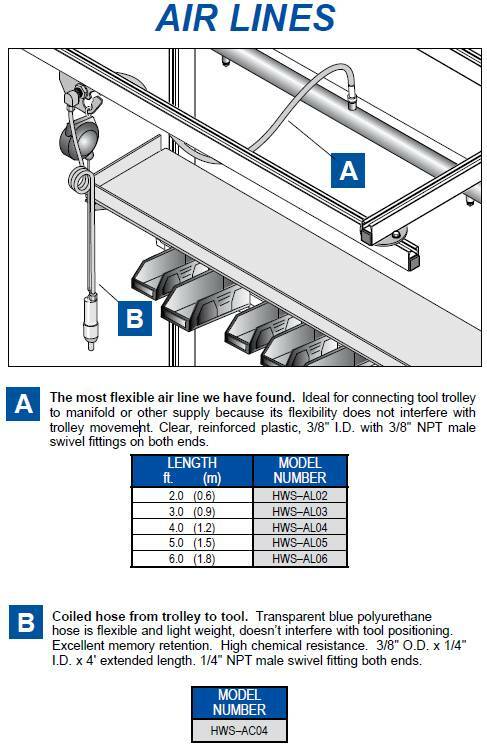 Extruded aluminum rail features double tracks (top and bottom), one for trolleys and the other for mounting components or concealing hose or cable. 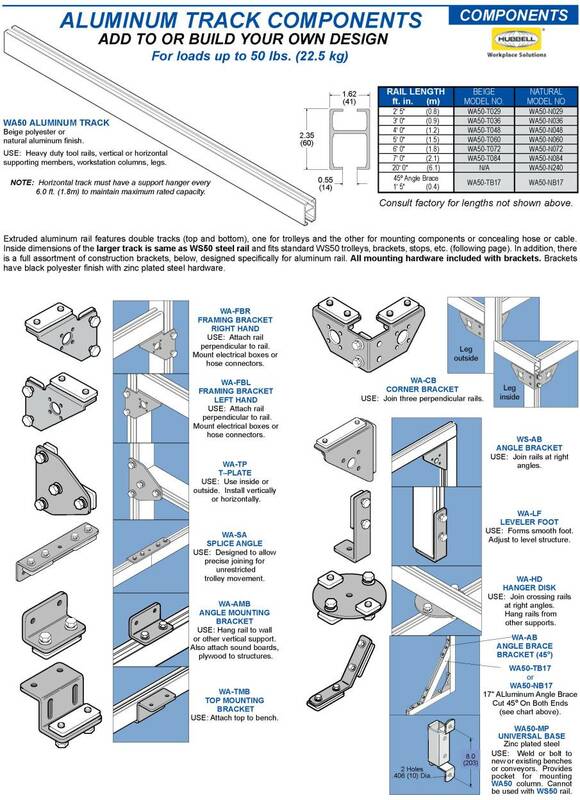 In addition, there is a full assortment of construction brackets designed specifically for aluminum rail. 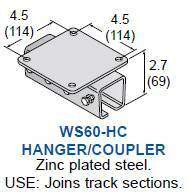 For information on additional assembly brackets, download "Steel Track-50 lb" page below. For loads up to 30 lbs. (13.5 kg). 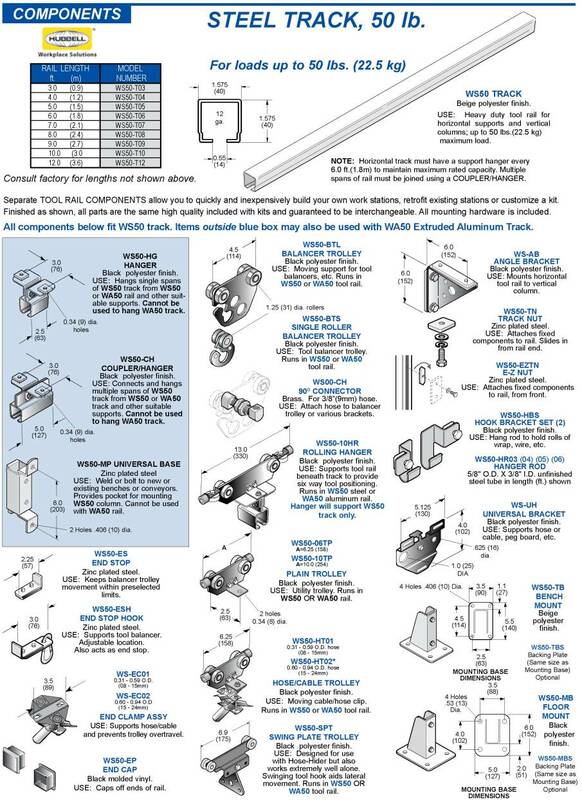 Separate TOOL RAIL COMPONENTS allow you to quickly and inexpensively build your own work stations, retrofit existing stations or customize a kit. 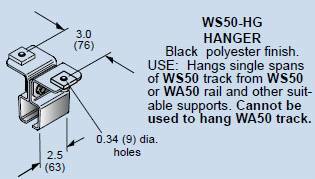 For loads up to 50 lbs. (22.5 kg). 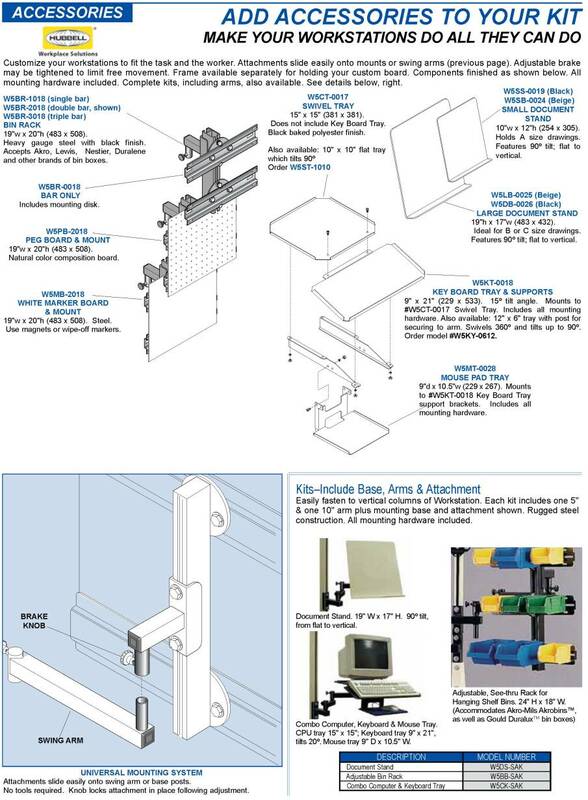 Separate TOOL RAIL COMPONENTS allow you to quickly and inexpensively build your own work stations, retrofit existing stations or customize a kit. 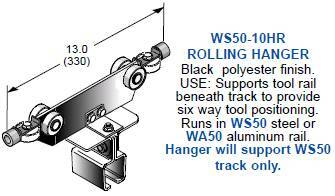 Most components also fit WA-50 aluminum track. 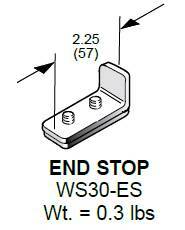 Hubbell Workplace Solutions: WS30 STEEL TRACK, 30 lb. 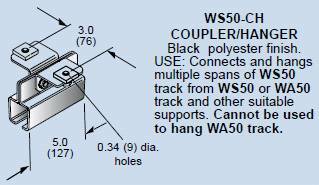 Hubbell Workplace Solutions: WS50 STEEL TRACK, 50 lb. Easily, quickly, inexpensively retrofit old "beaters" as well as new benches. 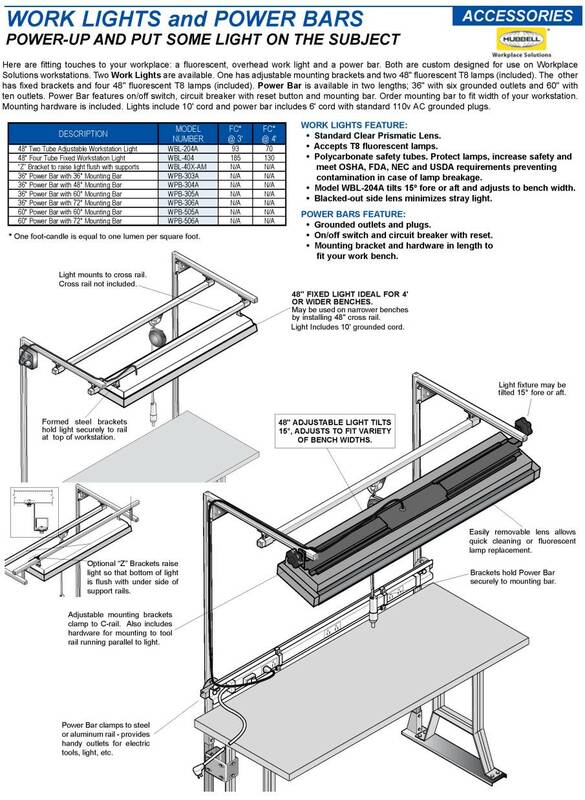 Hubbell Workplace Solutions kits contain everything needed to assemble ergonomically sound fixed workstations or mobile productivity boosters. 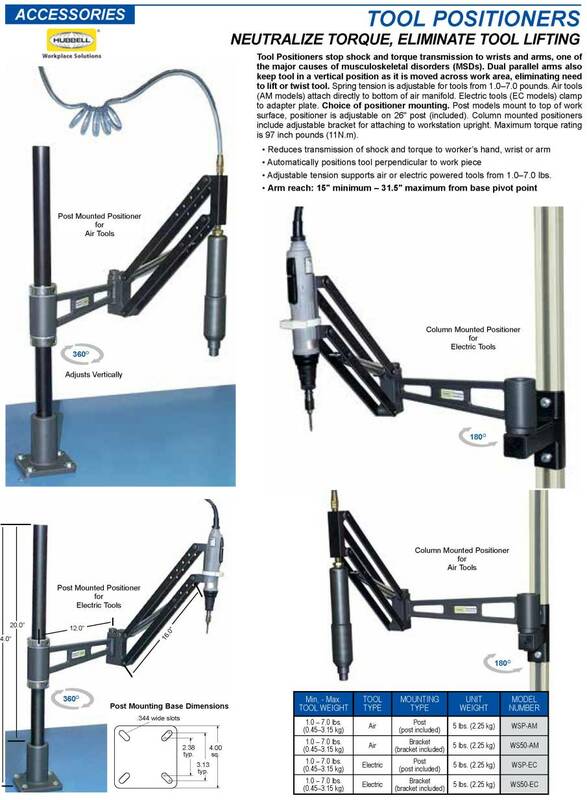 SINGLE COLUMN KITS are the efficient and economical way to meet ergonomic requirements. 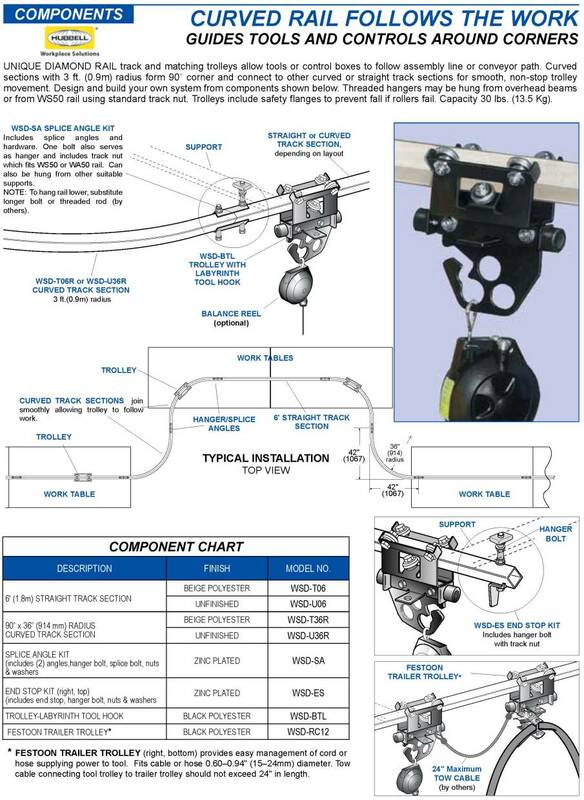 Each kit is complete with 180 degree swing or fixed boom, safety hook or balancer trolley and Universal Bracket for mounting everything from an air line fitting to peg board. 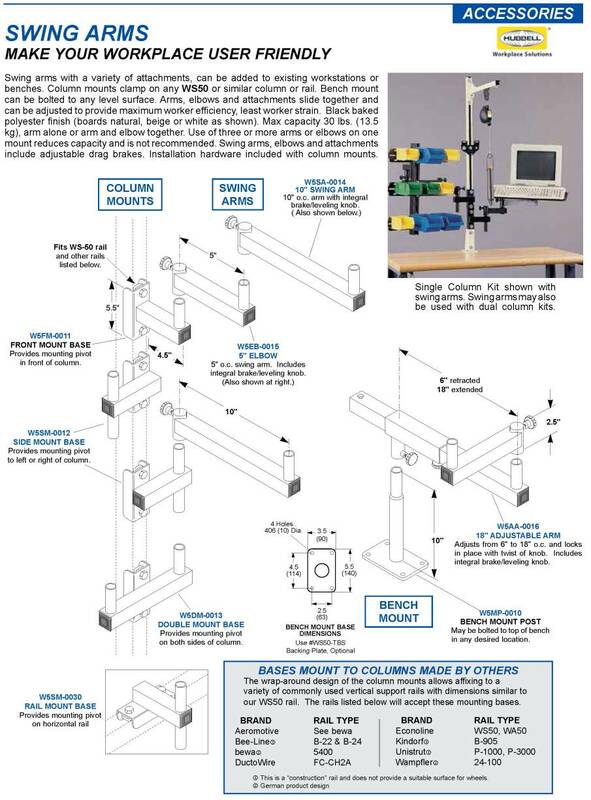 DUAL COLUMN WORKSTATION KITS include two straight or one curved tool rail, your choice of three mounting base styles and in a range of heights to fit virtually any bench and any task you have. Make your workplace user friendly. Available with Document Stand, Bin Rack, Computer Stand and other attachments. 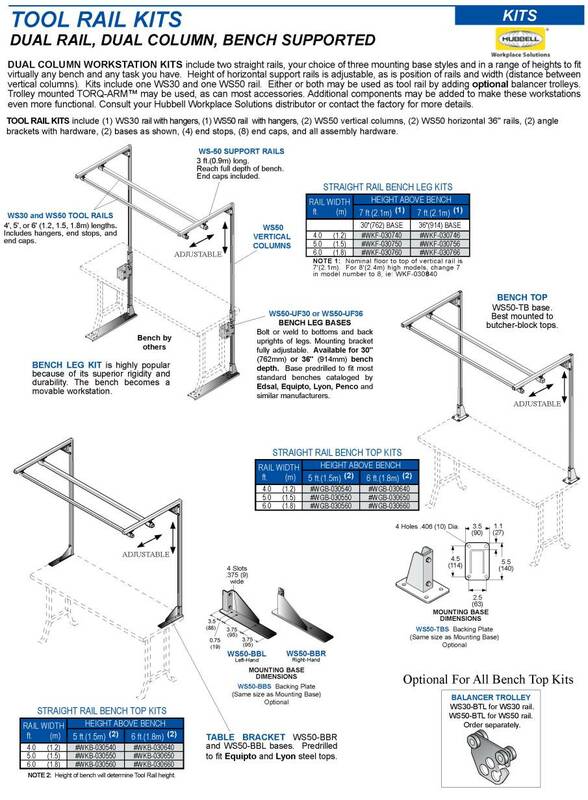 Swing arms can be added to existing workstations or benches. 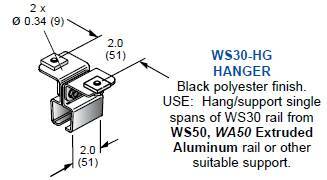 Column mounts clamp on any WS50 or similar vertical column. 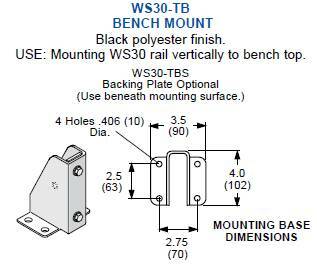 Bench mount can be bolted to any level surface. Arms, elbows and attachments slide together and can be adjusted to provide maximum worker efficiency...least worker strain. Black baked polyester finish (boards natural, beige or white as shown). Max capacity 30 lbs. (13.5 kg), arm alone or arm and elbow together. Use of three or more arms or elbows on one mount reduces capacity and is not recommended. Swing arms, elbows and attachments include adjustable drag brakes. 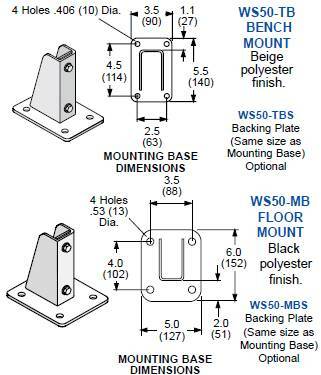 Installation hardware included with column mounts. 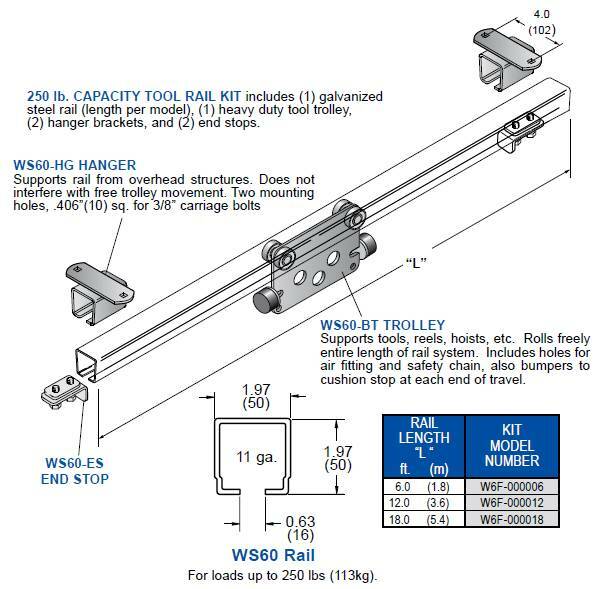 Designed for large air tool balancers, these tool rail kits are similar to our W3F and W5F tool support kits but much heavier. 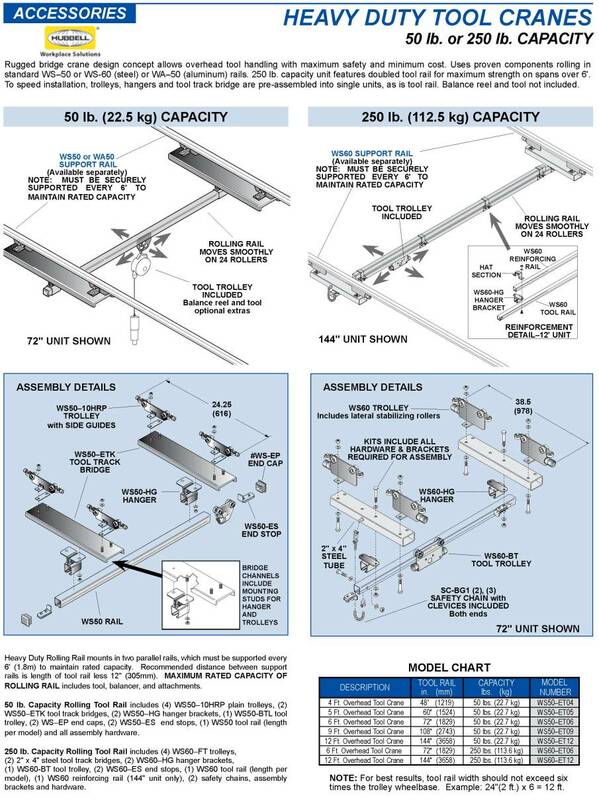 Must be supported every 6 ft.(1.8m) minimum to maintain full rated capacity.  Maximum 250 lb. (113kg) safe load rating. 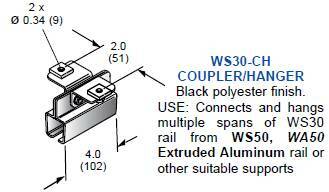  Galvanized for maximum corrosion protection.  Available in 6, 12 and 18 ft. (1.8, 3.6, 5.4m) lengths.  May be joined for any length. 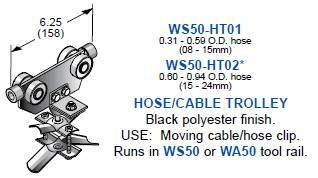 HEAVY DUTY TOOL CRANES 50 lb. or 250 lb. CAPACITY Rugged bridge crane design concept allows overhead tool handling with maximum safety and minimum cost. 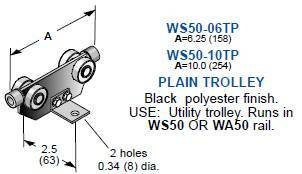 Uses proven components rolling in standard WS-50 or WS-60 (steel) or WA-50 (aluminum) rails. 250 lb. 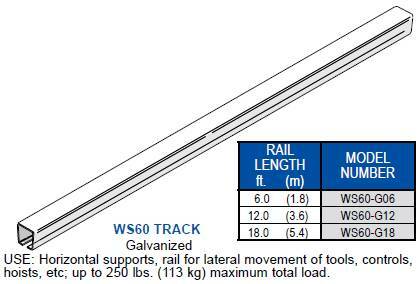 capacity unit features doubled tool rail for maximum strength on spans over 6'. 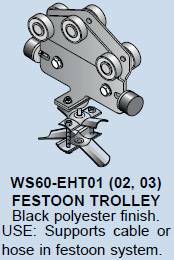 To speed installation, trolleys, hangers and tool track bridge are pre-assembled into single units, as is tool rail. 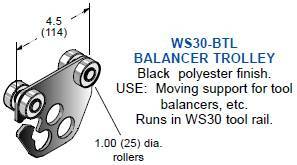 Balance reel and tool not included. 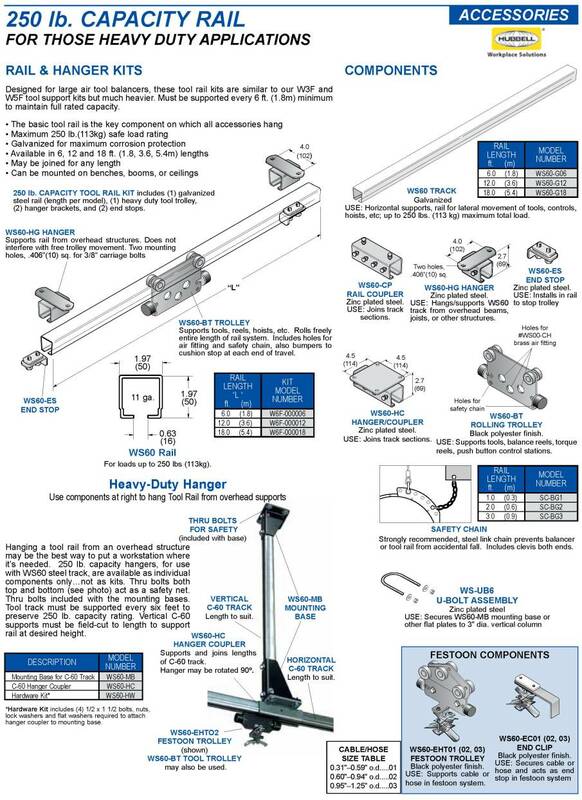 Unique diamond rail track and matching trolleys allow tools or control boxes to follow assembly line or conveyor path. 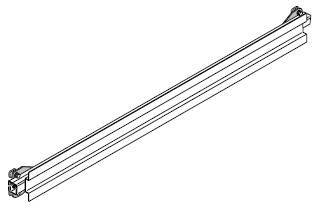 Curved sections with 3 ft. (0.9m) radius form 90o corner and connect to other curved or straight track sections for smooth, nonstop trolley movement. 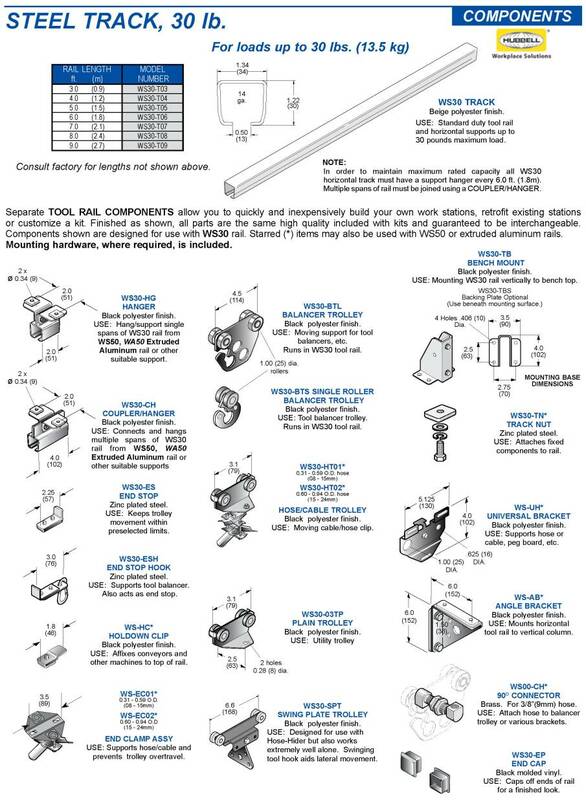 Design and build your own system from components shown below. 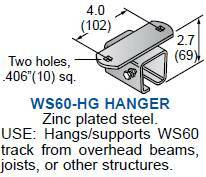 Threaded hangers may be hung from overhead beams or from WS50 rail using standard track nut. 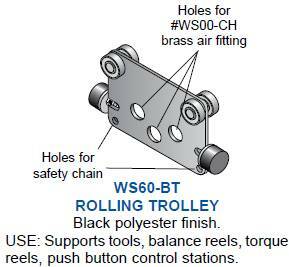 Trolleys include safety flanges to prevent fall if rollers fail. 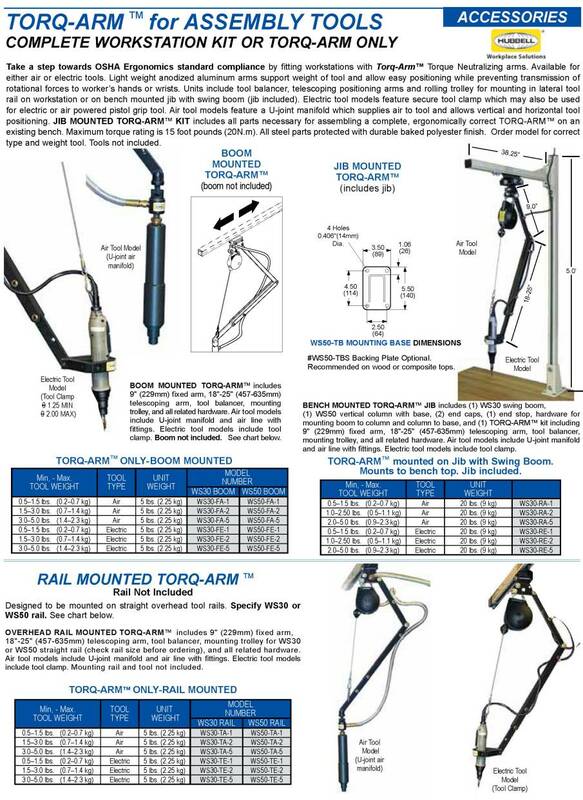 Take a step towards OSHA Ergonomics standard compliance by fitting workstations with Torq-ArmTM Torque Neutralizing arms and Tool Positioners. 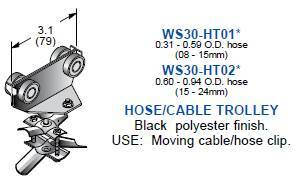 Available for either air or electric tools. 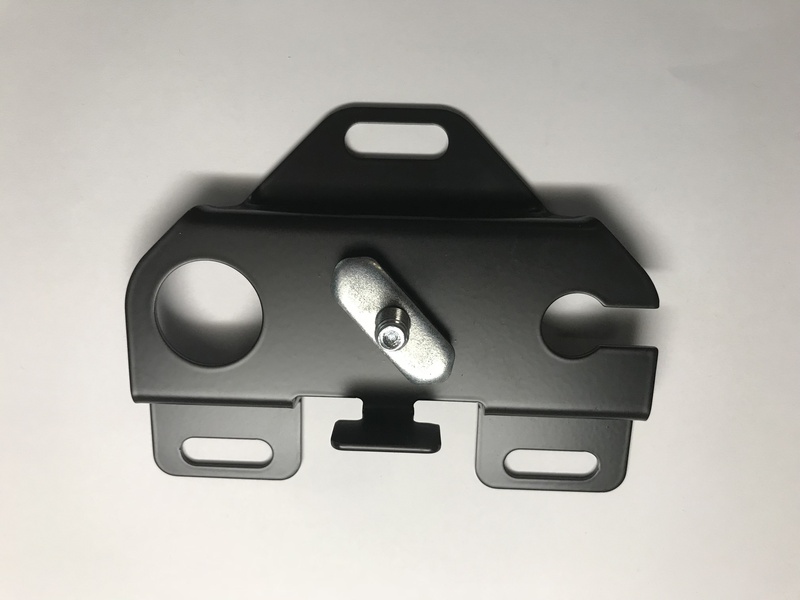 Light weight anodized aluminum arms support weight of tool and allow easy positioning while preventing transmission of rotational forces to worker's hands or wrists. 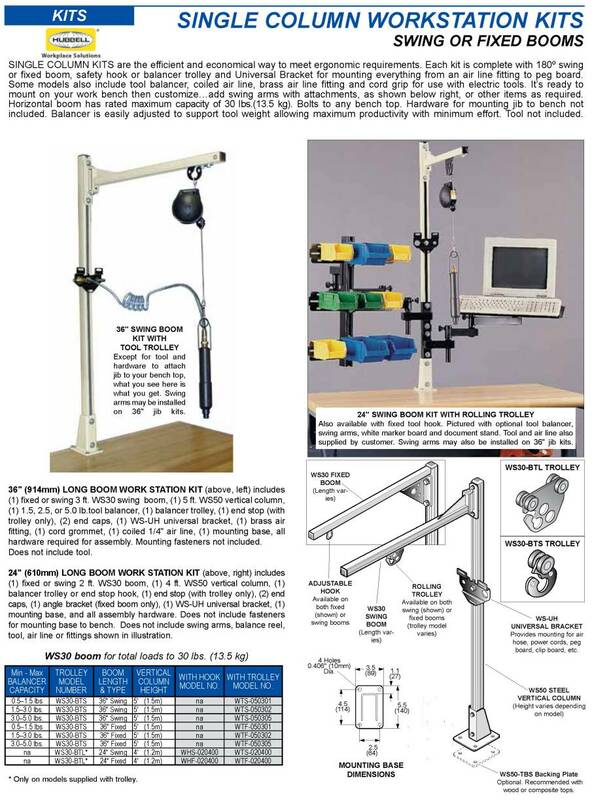 Units include tool balancer, telescoping positioning arms and rolling trolley for mounting in lateral tool rail on workstation or on bench mounted jib with swing boom (jib included). 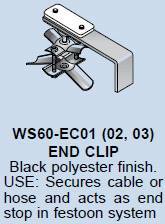 Electric tool models feature secure tool clamp which may also be used for electric or air powered pistol grip tool. Air tool models feature a U-joint manifold which supplies air to tool and allows vertical and horizontal tool positioning. 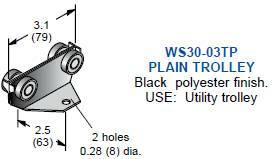 Tool Positioners feature adjustable tension to support air or electric powered tools from one to seven pounds. Positioners reach 12" to 25.5" from base to pivot point.